The remains have quite a story to tell, revealing that the primate endured an arduous sea journey before reaching land. The remains of the first known monkey in North America were recently unearthed in the southernmost point of the continent, Panama, according to a new study. The discovery suggests that the monkey, which would have looked like a modern capuchin, managed to travel across 100 miles of water dividing North America from South America 21 million years ago. The findings are published in the journal Nature. Co-author Jonathan Bloch, curator of vertebrate paleontology at the Florida Museum of Natural History on the University of Florida campus, said the discovery adds a new chapter to the "utterly bizarre" history of New World monkeys. "Somehow they made a transoceanic journey from Africa, then they dispersed throughout South America," Bloch said in a press release. 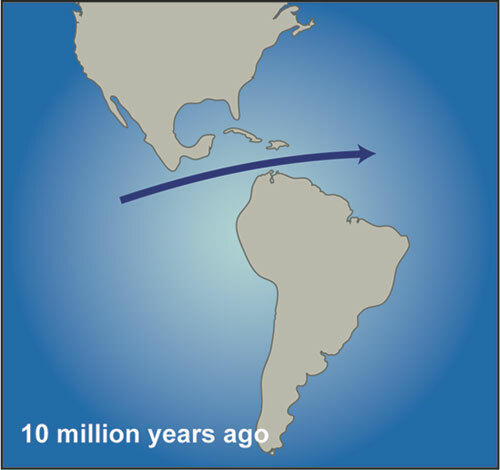 "Now we see that they, as far as we know, are the only mammal that successfully crossed the early Miocene Central American Seaway into present day Panama. So how were monkeys able to do this? Hopefully future fossil discoveries will help us better understand this extraordinary history." He and his colleagues say that the monkey might have swum across the ancient sea, but this would have required covering a distance of more than 100 miles, a difficult feat for even the most talented long-distance swimmers. They believe the monkey is more likely to have unintentionally rafted across on mats of vegetation, much like its earlier ancestors likely did when they made their way from Africa to South America. Video: Mind-Controlling Monkeys Are Here! The fossils of the pioneering North American monkey reveal the similarity to today's capuchins. Bloch and his team found the fossils during recent excavations related to the expansion of the Panama Canal. The monkey was not the only animal to make the journey from South America to North America. Fossils of other species from the same time period were also found near the monkey's remains. Now a question is: once the monkey and others of its kind made it to Panama, why didn't they travel long distances northward? "While the fossil mammals found with the monkey include horses, camels and squirrels that look like what paleontologists have found in the early Miocene of Mexico, Texas and Florida, the new monkey was limited to the southernmost point of the continent," co-author Aaron Wood said. He added, "The ancient South American-derived forests found in Panama were absent in northern Central America at the time, preventing monkeys from moving north, even though climate and geographic barriers like oceans did not wholly restrict their northward movements." Bloch suggested that maybe acorns in the northern forests just weren't particularly tasty to a South American monkey used to eating tropical fruit. The same dense jungles that offer monkeys such fruits as well as habitats also make it difficult for researchers now to hunt for fossils. Nevertheless, Bloch said, "We hope to find more monkey fossils, but time is definitely a factor." "We're fighting against the forest that wants to grow over the rocks again," he continued. "The expansion of the Panama Canal provides a once-in-a-century opportunity for these kinds of exciting discoveries. But we can't assume we'll always be able access these rock exposures." Close-up of a capuchin monkey, a primate very similar in appearance to North America’s first monkey, whose remains were recently found. ), a newly discovered Congo-based monkey with a human-like face. Anthropologist Eric Sargis of Yale University co-authored a PLOS ONE paper about lesula and said that "if we're finding new species of primates, then who knows how many new species of small mammals or lizards or insects, just to name a few, might be out there. There's certainly a lot of undiscovered biodiversity in this region (an evergreen Congo forest between the Lomami and Tshuapa rivers)." ) features very distinctive facial hair. Patricia Yakabe Malentaqui of Conservation International says this primate was named after Emperor Franz Joseph of Austria. The emperor tamarin sports a white curved "mustache" that hangs down as far as its chest. , or "Dutchman," because early Indonesians thought that the Dutch colonizers had equally large bellies and noses. According to Conservation International's "Handbook of the Mammals of the World," "Their long nose is used as a resonating chamber for its loud honking calls." ) give it a keen sense of hearing, all the better to listen for predators as well as calls within their large social groups. They also make it look a lot like Star Wars character Yoda. Various theories exist about what inspired Yoda. The late award-winning British makeup artist Stuart Freeborn, who designed and created Yoda, once admitted that his own face, as well as that of Albert Einstein, was incorporated into the famous character. The loudest monkey is the howler (various species in the genus Alouatta), which are known for their can't-miss guttural howls emitted at the beginning and end of each day. According to the Smithsonian National Zoological Park, howler monkeys are the loudest animals in the Americas. Their calls can travel for three miles, even through very thick tree growth in forests. The mandrill (one of two species in the genus Mandrillus) is the world's largest monkey. They stand about three feet tall and weigh approximately 77 pounds. Yakabe Malentaqui said that "alpha males show off their brightly colored genitalia to advertise their dominant status." On the other side of the size spectrum is the pygmy marmoset, which is not only the world's smallest monkey, but also one of the smallest primates on the planet. Each only weighs about 3.5 ounces. "They are largely restricted to river-edge forest and are known as a gum-feeding specialist, gnawing small holes in the bark of certain species of trees and vines to stimulate gum production which they lick up like maple syrup," Samantha Cartagena of Rainforest Trust told Discovery News. "They congregate in groups ranging between 5-9 adults." ). It can reach speeds of 34 miles per hour. Usually they make a run for it when being chased by predators in their West and East African habitats. They are not always running defense, though. Researchers observing these monkeys in the wild have seen them chasing after large and also fast-running prey, such as jackals and wildcats. Should Monkeys Go to School? Spider monkeys (genus Ateles) are among the longest living non-human primates. In zoos, they can live to around 50, which is quite advanced in monkey years. As they age, they may develop bald spots and require nutritional supplements to maintain their weight.
) has many good years ahead. The species, as for many other monkeys, is listed as being threatened (vulnerable) by the IUCN Redlist of endangered animals. Aside from its distinctive face, the red-faced spider monkey has one of the primate world's most impressive tails. The tail often grows longer than the rest of the body and has the ability to grasp. Photos: Why is the Color Red so Powerful?